Box jellyfish is the common name for any of the radially symmetrical, marine invertebrates comprising the Cnidarian class Cubozoa, characterized by generally well-developed eyes and a life cycle dominated by a cube-shaped medusa stage. The well-known cubozoan species, Chironex fleckeri, which is sometimes called the box jellyfish, is among the most venomous creatures in the world. The name sea wasp is also applied to Chironex fleckeri and some of the other cubozoan species. Members of Cubozoa, collectively, are known scientifically as cubazoans and commonly as box jellies. With bodies shaped roughly like a square bell with tentacles dangling from the corners, box jellies are agile and active swimmers based on their ability to contract the "bell" and forcefully expel water through a constricted opening at its base. Box jellies are important components of marine ecosystems, capturing and eating fish, crustaceans, and worms, and despite their barbed and poisoned nematocysts, being eaten by large fish and sea turtles. Box jellies frequent coastal tropical waters, especially around Vietnam, Hawaii, Australia, and the Philippines. Between 1954 and 1996, more than 5000 human lives were lost due to their venomous sting. Nonetheless, while the box jellies can be highly dangerous to swimmers, divers, and surfers who enter their habitat, they also add to the wonder and mystery of nature for people with their unique form and behavior. Box jellyfish are classified within Cnidaria, a phylum containing relatively simple invertebrate animals found exclusively in aquatic, mostly marine, environments. Cniderians comprise corals, sea anemones, jellyfish, sea pens, sea pansies, and sea wasps, as well as tiny freshwater hydra. The name of the phylum comes from cnidocytes—specialized cells carrying stinging "organelles," which produce specialized toxic secretory products. Theoretically, members of Cnidaria have life cycles that alternate between two forms—asexual polyps (the body as a vase-shaped form), and sexual, free-swimming forms called medusae (singular medusa; the body in a bell-shaped form). In reality, there is considerable variability among the four classes in the way that pattern is manifested. The class Anthozoa is characterized by the absence of medusae, living only as polyps, while the Scyphozoa live most of their life cycle as medusa. The diverse Hydrozoa species include some that live exclusively as polyps, some that live exclusively as medusae, and some species that alternate between the two (Towle 1989). In most taxa of Hydrozoa, the polyp is the most persistent and conspicuous stage, but some lack the medusa phase, and others lack the polyp phase (Fautin and Romano 1997). The life cycle of the class Cubozoa is dominated by the medusa form, which for them appears cube or square shaped, when viewed from above. Members of Cubozoa, Hydrozoa, and Scyphozoa are sometimes grouped together as "Medusozoa" because a medusa phase is present in all three (Fautin and Romano 1997). The cubozoan body is shaped like a square bell, with the mouth suspended inside it on a tube (the manubrium) that leads upward to the stomach, which is inside the top part of the bell. Extending around the inside bottom of the bell is a ring of tissue called the velarium, and at the bottom corners of the bell are muscular fleshy pads (pedalia), with one or more tentacles connected to each pedalium. Four sensory structures called rhopalia are located near the center of each of the four sides of the bell. Box jellyfish have eyes that are surprisingly complex, including regions with lenses, corneas, and retinas; however, box jellyfish do not have a brain, so how the images are interpreted remains unknown. Like all cnidarians, box jellyfish possess stinging cells that can fire a barb and transfer venom (Waggoner and Collins 2000). Cubozoans are agile and active swimmers, unlike the more planktonic jellyfish. They have been commonly observed to swim a meter in just five to ten seconds, and there are unconfirmed reports of large specimens of Chironex fleckeri swimming as fast as two meters in one second (Waggoner and Collins 2000). The high speeds are achieved through a kind of squirting action in which the medusa contracts while the velarium at the bottom contracts even more, producing a constricted opening through which the water is forcefully expelled. Box jellies can be found in many tropical areas, including near Australia, the Philippines, Hawaii, and Vietnam. Cnidarians take their name from a specialized cell, the cnidocyte (nettle cell). The cnida or nematocyst is secreted by the Golgi apparatus of a cell and is technically not an organelle but "the most complex secretory product known" (Waggoner and Collins 2000). Tentacles surrounding the mouth contain nematocysts. The nematocysts are the cnidarians' main form of offense or defense and function by a chemical or physical trigger that causes the specialized cell to eject a barbed and poisoned hook that can stick into, ensnare, or entangle prey or predators, killing or at least paralyzing its victim. Box jellyfish are voracious predators and are known to eat fish, crustacean arthropods, and worms, utilizing the tentacles and nematocysts (Waggoner and Collins 2000). When the tentacles contact the prey, the nematocysts fire into the prey, with the barbs holding onto the prey and transferring venom. The tentacles then contract and pull the prey near the bell, where the muscular pedalium pushes the tentacle and prey into the bell of the medusa, and the manubrium reaches out for the prey and mouth engulfs it (Waggoner and Collins 2000). Box jellies use the powerful venom contained in epidermic nematocysts to stun or kill their prey prior to ingestion and as an instrument for defense. Their venom is the most deadly in the animal kingdom and by 1996, had caused at least 5,567 recorded deaths since 1954 (Williamson et al., 1996). Most often, these fatal envenomations are perpetrated by the largest species of box jelly, Chironex fleckeri, owing to its high concentration of nematocysts, though at least two deaths in Australia have been attributed to the thumbnail-sized irukandji jellyfish (Carukia barnesi) (Fenner and Hadok 2002). Those who fall victim to Carukia barnesi suffer several severe symptoms, known as Irukandji syndrome (Little and Mulcahy 1998). The venom of cubozoans is very distinct from that of scyphozoans. Sea turtles, however, are apparently unaffected by the sting and eat box jellies. While Chironex fleckeri and the Carukia barnesi (Irukandji) species are the most venomous creatures in the world, with stings from such species excruciatingly painful and often fatal, not all species of box jellyfish are this dangerous to humans (Williamson 1996). Some biologists have theorized that box jellyfish actively hunt their prey, and quite effectively as they can move so quickly, instead of drifting as do true jellyfish. Box jellyfish are abundant in the warm waters of northern Australia and drive away most swimmers. However, they generally disappear during the Australian winter. Australian researchers have used ultrasonic tagging to learn that these creatures sleep on the ocean floor between 3 a.m. and dawn. It is believed that they sleep to conserve energy and to avoid predators. Box jellyfish are known to be the only jellyfish with an active visual system, consisting of multiple eyes located on the center of each side of its bell. The eyes occur in clusters on the four sides of the cube-like body, in the four sensory structures called rhopalia. Each rhopalia has six sensory spots, giving 24 sensory structures (or eyes) in total. Sixteen are simply pits of light-sensitive pigment (eight slit-shaped eyes and eight lens-less pit eyes), but one pair in each cluster is surprisingly complex, with a sophisticated lens, retina, iris, and cornea, all in an eye only 0.1 millimeters across. The lenses on these eyes have been analyzed and in principle it seems they could form distortion free images. Despite the perfection of the lenses, however, the retinas of the eyes lie closer to the lens than the optimum focal distance, resulting in a blurred image. One of these eyes in each set has an iris that contracts in bright light. Four of the eyes can only make out simple light levels. It is not currently known how this visual information is processed by Cubozoa, as they lack a central nervous system, although they seem to have four brain-like organs (Nilsson et al. 2005). Some scientists have proposed that jellies have a “nerve net” that would allow processing of visual cues. There are two main taxa of cubozoans, Chirodropidae and Carybdeidae, containing 19 known, extant species between them. The chirodropids and carybdeids are easy to distinguish morphologically. The carybdeidae, which includes the Carukia barnesi (Irukandji) species, generally have only one tentacle trailing from a single pedalium at each of the four corners the bell. In the Tripedalia species, however, while each tentacle is connected to a single pedalium, there are two or three pedalia on each corner of the bell, giving two or three tentacles trailing from each corner (Waggoner and Collins 2000). Box jellyfish of the Chirodropidae group, which contains the Chironex fleckeri species, are distinguished by always having only four pedalia, one at each corner, with each of the pedalia having multiple tentacles (Waggoner and Collins 2000). In other words, chirodropids have multiple tentacles connected to each pedalium, while carybdeids always have just one tentacle per pedalium (Waggoner and Collins 2000). The Integrated Taxonomic Information System (ITIS 2005a) recognizes two orders, three families, nine genera, and 19 species. The two orders are Carybdeida and Chirodropida. Within Carybdeida, ITIS (2005b) recognizes the family Carybdeidae. However, within Chirodropida, ITIS (2005c) recognizes two families, Chirodropidae and Chiropsalmidae. The family Carybdeidae comprises the genera Carybdea (6 species), Tamoya (2 species), and Tripedalia (1 species) (ITIS 2005b). The family Chirodropidae comprises the genera Chirodectes (1 species), Chirodropus (2 species), and Chironex (1 species), while the family Chiropsalmidae comprises the genera Chiropsalmus (3 species), Chiropsella (1 species), and Chiropsoides (2 species) (ITIS 2005c). For swimming at a beach where box jellies are known to be present, an extremely useful addition to the first aid kit is a bottle of vinegar. Following a sting, vinegar should be applied for a minimum of 30 seconds (Fenner et al. 1989). Acetic acid, found in vinegar, disables the box jelly's nematocysts that have not yet discharged into the bloodstream (though it will not alleviate the pain). Vinegar may also be applied to adherent tentacles, which should then be removed immediately; this should be done with the use of a towel or glove to avoid bringing the tentacles into further contact with the skin. These tentacles will sting if they are separate from the bell or if the creature is dead. Removing the tentacles without first applying vinegar may cause unfired nematocysts to come into contact with the skin and fire, resulting in a greater degree of envenomation. If no vinegar is available, a heat pack has been proven for moderate pain relief. However, careful removal of the tentacles by hand is recommended (Hartwick et al. 1980). Vinegar has helped save dozens of lives on Australian beaches. Although commonly recommended in folklore and even some papers on sting treatment (Zoltan et al. 2005), there is no scientific evidence that urine, ammonia, meat tenderizer, sodium bicarbonate, boric acid, lemon juice, freshwater, steroid cream, alcohol, coldpack, or papaya will disable further stinging, and these substances may even hasten the release of venom (Fenner 2000). Pressure immobilization bandages, methylated spirits, or vodka should never be used for jelly stings (Hartwick et al. 1980; Seymour et al. 2002). Often in severe Chironex fleckeri stings cardiac arrest occurs quickly, so Cardiopulmonary resuscitation (CPR) can be life saving and takes priority over all other treatment options (including application of vinegar). The emergency medical system should be activated for immediate transport to the hospital. Pantyhose, or tights, were once worn by Australian lifeguards to prevent stings. These have now been replaced by lycra stinger suits. Some popular recreational beaches erect enclosures (stinger nets) offshore to keep predators out, though smaller species such as Carukia barnesi (Irukandji Jellyfish) can still filter through the net (Nagami 2004). Fautin, D.G., and S.L. Romano. 1997. Cnidaria. Sea anemones, corals, jellyfish, sea pens, hydra. Tree of Life web project, Version 24, April 1997. Retrieved May 24, 2008. Fenner, P. 2000. Marine envenomation: An update—A presentation on the current status of marine envenomation first aid and medical treatments. Emerg Med Australas 12(4): 295-302. Retrieved May 25, 2008. Fenner, P., and J. Hadok. 2002. Fatal envenomation by jellyfish causing Irukandji syndrome. Med J Aust 177(7): 362-3. Retrieved May 25, 2008. Fenner, P., J. Williamson, and J. Blenkin. 1989. Successful use of Chironex antivenom by members of the Queensland Ambulance Transport Brigade. Med J Aust 151(11-12): 708-10. Retrieved May 25, 2008. Hartwick, R., V. Callanan, and J. Williamson. 1980. Disarming the box-jellyfish: Nematocyst inhibition in Chironex fleckeri. Med J Aust 1(1): 15-20. Integrated Taxonomic Information System (ITIS). 2005a. Cubozoa. ITIS Taxonomic Serial No. : 51449. Retrieved May 24, 2008. Integrated Taxonomic Information System (ITIS). 2005b. Carybdeida Claus, 1886. ITIS Taxonomic Serial No. : 718929. Retrieved May 24, 2008. Integrated Taxonomic Information System (ITIS). 2005c. 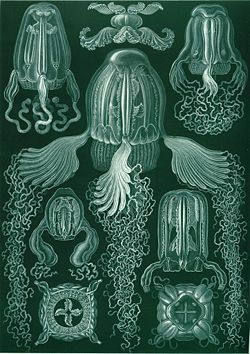 Chirodropida Haeckel, 1880. ITIS Taxonomic Serial No. : 718932. Retrieved May 24, 2008. Little, M., and R. Mulcahy. 1998. A year's experience of Irukandji envenomation in far north Queensland. Med J Aust 169(11-12): 638-41. Retrieved May 25, 2008. Nagami, P. 2004. Bitten: True Medical Stories of Bites and Stings. St. Martin's Press, 54. ISBN 0312318227. Nilsson, D. E., L. Gislén, M. M. Coates, et al. 2005. Advanced optics in a jellyfish eye. Nature 435: 201-205. Retrieved May 25, 2008. Seymour, J., T. Carrette, P. Cullen, M. Little, R. Mulcahy, an P. Pereira. 2002. The use of pressure immobilization bandages in the first aid management of cubozoan envenomings. Toxicon 40(10): 1503-5. Retrieved May 25, 2008. Waggoner, B., and A.G. Collins. 2000. Introduction to Cubozoa: The box jellies! University of California Museum of Paleontology'. Retrieved May 24, 2008. Williamson, J. A., P. J. Fenner, J. W. Burnett, and J. Rifkin. 1996. Venomous and Poisonous Marine Animals: A Medical and Biological Handbook. Surf Life Saving Australia and University of New South Wales Press. ISBN 0868402796. Zoltan, T., K. Taylor, and S. Achar. 2005. Health issues for surfers. Am Fam Physician 71(12): 2313-7. Retrieved May 25, 2008. Box Jelly Fish, dangers on the great barrier reef. This page was last modified on 22 June 2016, at 15:34.